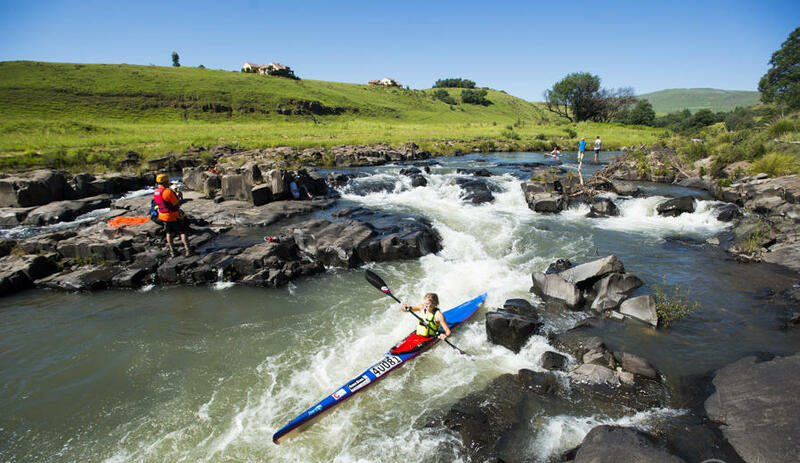 The legendary rapid named after Steve Black and John Murray, who pioneered this top section of the river. The river meets a solid rock shelf that forces a number of twists and turns that can be handled differently at different water levels. At a low to medium level the rapid must be approached from the right, dropping into a diagonal line that takes you into the main current on the left where you turn before lining up an exit on the left through a pile of rocks. However at a medium level and above a straighter line is opening up, as shown on this video. Head for the large rocks on the right, aiming to skirt it on the left. Paddle hard to avoid being pushed around by the water here. Once past the rock straighten up and taken on the last drop. The last drop is surprisingly big – possibly the biggest wave of the race. Just hit the waves head on and paddle positively. There is a nice deep pool below, should you need to gather your toys!